Stamps dated 1290 (= 1873-74) Plate A. 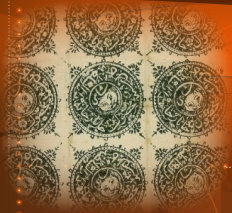 Made up of 15 Shahi types, SG 12. Outer circle with four corner ornaments. Position 6 shows top right corner ornament roughly restored. Pair with positions 5 and 6 from an early state of the plate, position 6 showing the missing corner ornament. This was noticed very quickly and the ornament was roughly added to the stone (as in the reconstruction above). This example is ex Hopkins. The stamps are cancelled over the lion's head, indicative of use from Tashkurghan. Plate A (position 8). On part cover with scissor cut cancellation. via Peshawur, Rawulpinde Jan 28, Lahore Jan 29, Allahabad Feb 1, and Bombay Feb 2. Boxed Indian postage due mark. Plate A. Vertical Pair (Positions 1 and 4). Used on reverse of internal cover with cancelling tears. 1290 Plate B, without corner ornaments. Positions 32 and 33, used on cover with cancelling tears. Plate B. Position 36 Cover with mutilation and penstroke cancellations, indicating use at Kabul. Plate B. Position 11. Cover with mutilation and penstroke cancellations, indicating use at Kabul.